Antonio M. Echavarren was born in Bilbao and obtained his PhD at the Universidad Autónoma de Madrid (UAM, 1982). After a postdoctoral stay in Boston College he joined the UAM as an Assistant Professor (1984-1986). Following a two years period as a NATO-fellow at the Colorado State University, he joined the Institute of Organic Chemistry of the CSIC in Madrid, where he stayed until 1992. That year he returned to the UAM as a Professor of Organic Chemistry. He is also CISC Professor of Research since 2004. He moved in 2004 to Tarragona as a Group Leader at the Institute of Chemical Research of Catalonia (ICIQ). He has been Liebig Lecturer (German Chemical Society, 2006), Abbot Lecturer in Organic Chemistry (University of Illinois at Urbana-Campaign, 2009), Schulich Visiting Professor (Technion, Haifa, 2011), Sir Robert Robinson Distinguished Lecturer (University of Liverpool, 2011), Novartis Lecturer in Organic Chemistry (Massachusetts Institute of Technology, 2015). In 2012 he got a European Research Council Advanced Grant and in 2014 he was President of the 49th Bürgenstock conference. Prof. Echavarren is a member of the International Advisory Board of ChemSusChem (2007-), Organic & Biomolecular Chemistry (2008-), Chemical Society Reviews (2010-), Advanced Synthesis and Catalysis (2011-), and Organic Letters (2014-), member of the Editorial Board of ChemCatChem (2009-) and Chemistry European Journal (2014-), Associate Editor of Chemical Communications (2011-), and Fellow of the Royal Society of Chemistry. He received the 2004 Janssen-Cylag Award in Organic Chemistry and the 2010 Gold Medal of the Royal Spanish Chemical Society. In 2015 he received an Arthur C. Cope Scholar Award from the American Chemical Society. 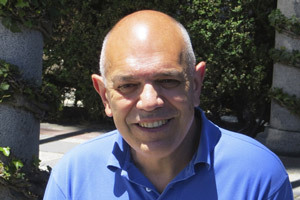 He is the current President of the Spanish Royal Society of Chemistry. Prof. Echavarren is the author of more than 270 scientific publications (h index = 69) and has supervised 49 PhD Thesis, 43 Master Thesis, and 60 postdoctoral associates. He was featured in the “Author Profile section” of Angewandte Chemie (DOI: 10.1002/anie.201606837).